Garage Cabinets in Wisconsin: Great Gifts for Your Mechanic or Car JunkieGarage Interiors, Inc. If the love of your life is a car junkie or a mechanic, you know just how valuable a nice garage is to them. Whether it’s for a birthday, anniversary, holiday or just because, finding meaningful gifts for this person can be challenging. The last thing that you want to do is head out and buy them their favorite car model (who has the money for that? ), but you do want to make sure that you’re gifting them something meaningful and thoughtful. As individuals that can equally appreciate a nice garage, we have a long list of gift ideas that you can turn into a reality. Keep reading to see a few of the ideas that we think your loved one would enjoy. When you’re working on cars you’re bound to wind up with tons of tools. While you might not mind a mess in the garage, there’s something great about having a nice toolbox to keep your tools organized in that every mechanic and car junkie can appreciate. There are so many different designs and sizes that you can choose from to make this gift the perfect one of the individual in mind. You could even look into customizing it so that it’s even more unique! If the person that you’re shopping for loves being around cars, why not take them to an event where they get to enjoy them. Cars are a passion for many people, but there are so many different ways that a person can appreciate a car that there are equally as many events for them to attend. If the person that you’re shopping for loves to look at the craftsmanship of a classic car, finding a local car show to attend might be the best option. On the other hand, if the person you’re searching for a gift for loves building cars and driving rough, search for a demolition derby. There are also plenty of places where you can make it possible for your car lover to get behind the wheel of some incredible cars and take it for a spin. Remember, gifts don’t have to be an item — experiences are equally as valuable and special to give to someone. When someone is passionate about cars, it’s pretty easy to always be on the lookout for upgrades to their vehicle. Even when so much work has been done, there’s always something else that they’re ready to do. Whether you have to take some time to ask them or you have an idea of what their next project is going to be, finding accessories or parts that they’ve been on the lookout for can make for a great gift. Not only is doing so a thoughtful way to show them that you listen to them and are invested in their projects too, but it’s something that you know they’re going to use. You really can’t go wrong with that! If you’re looking for a gift idea that’s a little bit out of the box, an upgrade to the garage flooring is a thought in the right direction. Depending on how the garage is being used (repairs, storage, projects, etc.) there are different types of flooring upgrades that you can look into. Whether it’s a softer finish that protects the car that’s being stored in the garage or it’s a sleek look that simply upgrades the garage as a whole, any individual that appreciates their garage is going to appreciate the thought of giving the garage floor an upgrade. Not sure what type of flooring options there are? Take some time to learn about the polyaspartic and garage flooring upgrades that we offer at Garage Interiors, Inc. When you use your garage on a routine basis it’s easy for it to become cluttered and disorganized. Whether the individual that you’re shopping for has a bunch of tools scattered about or they simply need a solution to help optimize the amount of space in their garage, a storage system is a fantastic gift idea. Whether you opt for garage cabinets that help make more room in the garage or you choose a storage system that gives them more room for all of the tools that they use, this is a gift that they’re guaranteed to appreciate. The best part is that there are now endless options in terms of storage systems which makes it so much easier for you to find something that’s unique to the person you’re shopping for. If you’re interested in garage cabinets or storage systems, garage floor lining, or something similar, browse the different collections that we have online. We’ve made it easy for you to browse the different options that we carry, quickly place your order, and enjoy stress-free delivery. 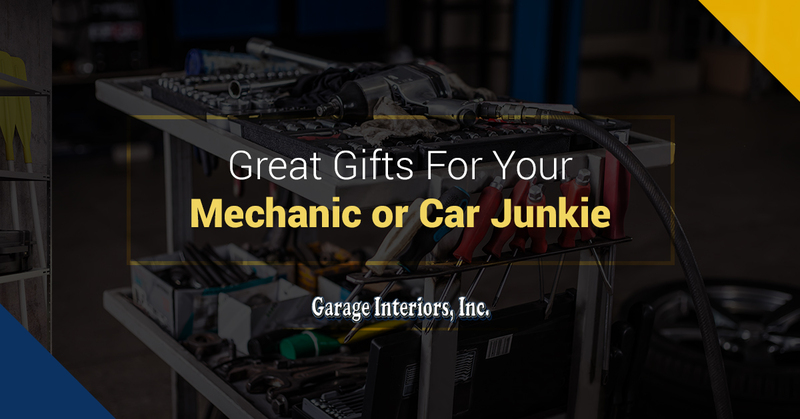 Find the best gift for your garage junkie on Garage Interiors, Inc. today.